First launched in 2008 as a range of smartphones by Sony Ericsson, Xperia handsets were expected to give the company a foothold in what was fast becoming a hugely competitive market. However while handset designs have looked great, poor marketing, strong competition and being late to adopt Android has meant that Sony’s dent on the market has been minimal. And this is what makes the new range of Xperia phones an even more interesting, and crucial, launch. Launched during the industry’s flagship event, Mobile World Congress (MWC), in February, the Xperia NXT series of phones includes the Xperia S, Xperia P and Xperia U, all targeted at different ends of the market. Newly rebranded Sony Mobile, following Sony’s purchase of Ericsson’s 50% stake, there is a renewed expectation that this and a new range of Xperia handsets will catapult the company into the major leagues of smartphone manufacturers. I can’t help but draw similarities between the fortunes of Sony Mobile and HTC. Both companies experienced a tough 2011, with HTC experiencing a 26% fall in profits during quarter four and Sony Ericsson announcing losses of £206 million for the year in full. Neither manufacturer produced handsets of any note and fell behind as both Apple and Samsung’s fortunes surged. 2012 is clearly a make-or-break year for both companies and both took to MWC with the same strategy: to launch a series of three new phones targeted at different areas of the market. You can read about the HTC One Series here. While HTC has given each member of its One Series a different look, Sony has taken the bold step of giving each handset a similar design, differentiated only by the colour of the bottom band; black for the S, silver for the P and pink for the U. Despite sharing a similar design on the outside, there are subtle differences between the three handsets, so let’s take a look under the hood. The Xperia range is a led off by the top of the range Xperia S, which is an HD smartphone sporting a 4.3-inch LED-backlist LCD display and 1280x720p resolution. This is a full 0.3” bigger than the Xperia P and 0.8” larger than the Xperia U. The Sony Mobile Xperia S ships with a generous 32GB of internal storage but rather disappointingly, Android’s 2.3 Gingerbread operating system, although there are plans for it to upgrade to Ice Cream Sandwich and 4.0. Its 1.5 GHz dual-core processor spec only matches HTC’s One S, which it has positioned as the mid-range handset in its new series. Camera-wise, the phone is in the premier league, with a 12MP, 4000×3000 pixels resolution and LED flash. Similar to the HTC’s One X, it has geo-tagging with face and smile detection but also features 3D sweep panorama and image stabilisation – its front-facing camera is the standard 1.3MP. Despite being at the top-end of the range, some rather competitive Sony Xperia S deals can be had with a free Xperia S handset and 300 minutes, unlimited texts, 750MB of data on T-Mobile for £17 a month over two years. Compared to HTC’s flagship One X, this is a very competitive price. The Sony Xperia P is your mid-range handset in the series and comes equipped with a suite of goodies to fit. Expected to be launched in the UK in April, again it will ship with Android’s 2.3 Gingerbread on board powered by a dual-core 1GHz processor, although there are plans to upgrade this to Ice Cream Sandwich. With a 4-inch screen and 275 ppi pixel density, the phone sits somewhere between the iPhone 4S and Samsung Galaxy S II in terms of its size. The camera is smaller than the Xperia S at 8MP, but is perfectly adequate for a smartphone, matching both the iPhone 4S and Samsung Galaxy S II. It also has all the extra camera features that you’ll find on the S, so these actually push the phone into the premier league. 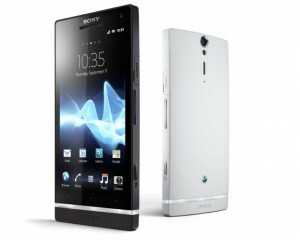 Sony Mobile has positioned the Xperia U as its entry-level handset and is an affordable and well-appointed handset. Available in black and white cases with changeable bottom caps in white, black, pink and yellow, this is Sony Mobile’s fun and funky handset in the new range. The phone is currently shipping with Android’s 2.3 Gingerbread operating system, although there are plans to upgrade to Ice Cream Sandwich. With a 1 GHz dual-core processor, this is the baby of the bunch from a performance point of view. The primary camera is stripped down 5MP with 2592x1944p resolution, though comes with the bells and whistles you’ll get on the S, with an LED flash, face and smile detection, geo-tagging, touch focus, 3D panorama sweep and image stabilisation. With Sony being known for its quality of sound, you would expect strong audio technology with the Xperia range and it doesn’t disappoint with 3D surround as standard. Coming in at the bottom end of the market, you can get some fantastic Sony Xperia U deals with Mobilesplease, with a free handset and £295 cashback on a 24 month contract being offered by Into Mobilephones currently. It’s worth noting at this stage that while the Sony Xperia S is available to buy in the UK, the Xperia U and Xperia P are slated for release in April 2012.